The late gay computer genius and World War II codebreaker Alan Turing was honoured with a posthumous award at the Attitude Awards yesterday evening. The posthumous Icon Award for Outstanding Achievement was accepted by two of his nieces, and was presented by the Speaker of the House of Commons John Bercow. 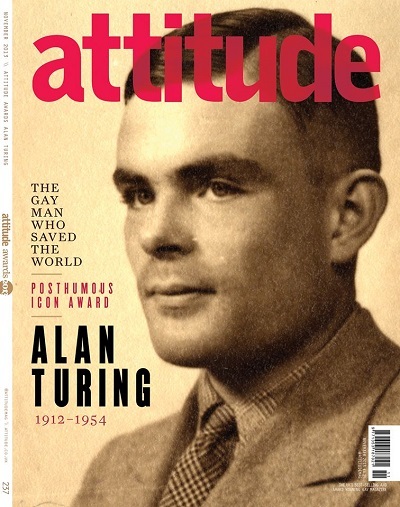 Today six commemorative Attitude Awards Issue covers were released with one being Turing. It reads “The gay man who saved the world”. The Imitation Game, a biopic about Turing which stars Benedict Cumberbatch and Keira Knightley, began principal photography in the UK last month. In May, a private member’s bill was introduced in the House of Lords, seeking to pardon Turing, who was prosecuted for “gross indecency” in 1952 after having a relationship with another man. A New Alan Turing sculpture was also unveiled in London to commemorate the computer genius’s legacy. John Bercow will host and present the PinkNews Awards on 23 October in the Palace of Westminster.